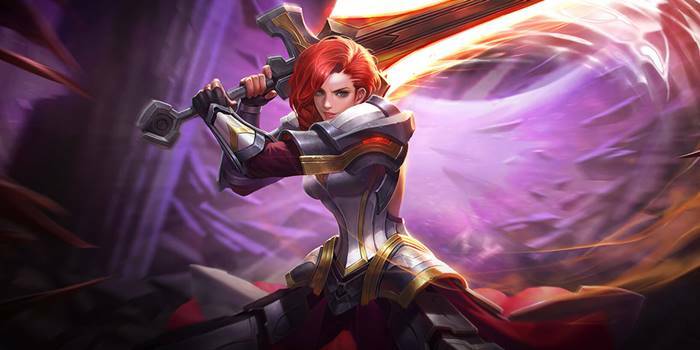 Astrid Item Builds Guide for Arena of Valor (AoV). Each build is geared toward a different play style, so choose one that fits your personal preference. These items are necessary in order to play Astrid optimally. Only diverge from a core item if you are a very experienced player or you have a very good reason for doing so. Mantle of Ra Mantle of Ra gives Astrid armor, attack damage, and a damaging aura which synergizes well with her aggressive, frontlining playstyle. All of these stats suit the warrior well, simultaneously upping her damage and survivability. Rankbreaker Rankbreaker allows Astrid to demolish squishy targets with the armor pierce it provides. This stacks with her Fearless Charge, leaving the target with very little defense early game. It also provides her with much needed out-of-combat movement speed to allow her to set up ganks and to get into position when engaging. Frost Cape Frost Cape complements Astrid’s ability to engage by giving her some ability to slow opponents. This works very well with her Fearless Charge, the enhanced attack benefitting from the enhanced damage. Stats-wise, Frost Cape offers coverage against physical damage, grants her good bonus HP and cooldown reduction. Spear of Longinus Spear of Longinus is an armor piercing item with more of a defensive edge than Rankbreaker. It shreds through enemy defenses with each attack its wielder lands, offering armor and cooldown reduction as well. When engaging, Spear of Longinus allows Astrid to tank some of the opponent’s initial damage. Omni Arms An alternative choice to Frost Cape. NEVER TAKE BOTH. While lacking the beneficial slow of Frost Cape, Omni Arms provides a wide range of beneficial stats that help Astrid rip apart foes in fights. The passive ability pairs amazingly with Fearless Charge, turning the increased damage into a high-damage physical nuke. The additional attack speed is also a great way to help Astrid get her shield up more frequently. Gaia’s Standard Gaia’s Standard is a good magic defense that also provides a decent amount of HP regeneration in team fights. Apart from the bonus HP and magic defense, Gaia’s Standard also grants decent movement speed to help Astrid get to fights and position herself when brawling..
Mail of Pain Mail of Pain is a situational, used to counter opposing marksmen, assassins, or warriors. Its passive will make your opponents think twice before hitting you with normal attacks. Hercules’ Madness A typical bruiser item, Hercules’ Madness enhances your ability to duel or tank. This is due to the shield and bonus attack damage it provides whenever your health drops below 40%. In terms of stats, it gives moderate armor and magic defense. Fenrir’s Tooth More of a luxury item than anything, Fenrir’s Tooth can make Astrid’s ultimate into even more of an amazing finisher. The damage amplification adds to both the ability’s normal damage and the true damage on low health enemies. In addition, the high amount of attack damage it provides will also pump up her damage output and the amount of protection that her shield offers, making this a nice way to finish out a build. Medallion of Troy Medallion of Troy is her goto item for magic defense. Its shield allows her to soak up some additional magic damage and the health it provides will keep her up and running after that fails.. This, along with her Bladed Guardian passive, allows her to take quite a bit of punishment without risk to her health. Hyoga’s Edge Hyoga’s Edge is a defensive item that gives Astrid’s normal attacks some additional utility. Attacking enemies will slow them and increase Astrid’s movement speed. She needs to stay close to her targets to fight them effectively, making this a very useful tool for her. Gilded Greaves Gilded Greaves works best for Astrid since she has to be rid of disables as quickly as possible so that she can continue swathing opponents with her kit. Getting this boots upgrade is also a good choice if the opposing team has a lot of magic damage and control abilities. Sonic Boots Sonic Boots works best against enemies who deal massive damage from their normal attacks. Get this over Gilded Greaves if the opposing marksman or melee warrior is becoming a problem. This build revolves around making Astrid a formidable front liner. A majority of the items here offer both offensive and defensive stats, Mantle of Ra, Frost Cape, and Hercules’ Madness all offering aggressive passive effects as well. Rankbreaker stands as the only purely offensive item, but the amount it offers Astrid is too good to pass up. On the other side of the spectrum, Medallion of Troy helps Astrid with magic defense as the only purely defensive item in the build. Astrid benefits quite a bit from large amounts of attack damage, so this build is focused on giving her as much as possible while remaining a bit durable. The only item that does not raiser her attack damage in some way is Frost Cape, however the slow it provides is a very useful tool in sticking close to enemies. When outfit with these items, Astrid will need to play much more aggressively than otherwise, constantly trading with the enemy to chip away at their health. Throw defense to the wayside and show off why Astrid is the Indomitable. Your attacks will explode with a righteous fury as you rush your enemies with a Fearless Charge. The attack speed will have her shield up much more frequently and the attack damage will turn it into a considerable wall of muscle. To finish it off, Dire Blow will absolutely destroy squishy units, taking huge swaths out of tanks’ health as well. Just try not to get with disables; that’d be bad.